Former Gov. Palin posted a note on her Facebook page about Afghanistan Tuesday. WASHINGTON (CNN) – Former Republican vice presidential hopeful Sarah Palin has once again taken to Facebook to make her voice heard in the national debate - this time over military strategy in Afghanistan. Palin published a note on her Facebook page Tuesday that encourages President Barack Obama to grant a request for the tens of thousands of additional troops reportedly requested by Gen. Stanley McChrystal, the top U.S. commander in the country. 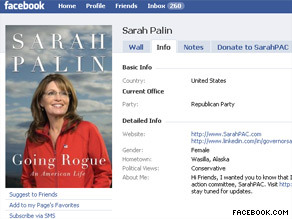 "Now is not the time for cold feet, second thoughts, or indecision," Palin wrote on the site. "It is the time to act as commander-in-chief and approve the troops so clearly needed in Afghanistan." Noting the possible consequences of not helping to build up Afghanistan's institutions, the former Alaska governor also wholeheartedly endorsed McChrystal's counterinsurgency approach to continued U.S. military presence in the country. Democrat Creigh Deeds appeared at a candidate forum in northern Virginia on Tuesday. WASHINGTON (CNN) - Virginia gubernatorial candidate Creigh Deeds, a Democrat, argued Tuesday that the Obama administration’s contentious economic agenda has been a drag on his campaign. With slightly under a month to go until Election Day on November 3, Deeds trails Republican Bob McDonnell in the polls. McDonnell has tried to tie Deeds to some of the more controversial legislative items being debated in Washington, particularly health care reform and the union-friendly Employee Free Choice Act. 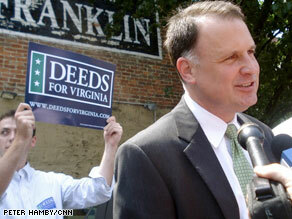 Deeds said his campaign is now “re-framing” the race to keep a focus on Virginia issues. He told the moderators that he disagrees with Obama on “some issues” but only named one: the cap-and-trade legislation currently before Congress. He did, however, give the president points for his handling of economic crisis. “Frankly, I don’t think he’s getting enough credit right now for lots of good signs that are emerging in the economy,” he said. WASHINGTON (CNN) - The U.S. Department of Education is looking to give innovative school districts and non-profit organizations a share of $650 million in education stimulus money now available in a new fund, Secretary of Education Arne Duncan said Tuesday. "There are many, many great ideas out there," Duncan told reporters on a conference call announcing his department's Investing in Innovation fund. This newest pot of education stimulus money will be allocated directly to local districts - not through state education departments - with the money going to districts that either have a program that is working and needs to be expanded, or have a new idea that needs to be developed. 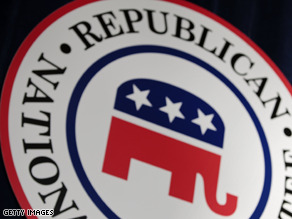 The Republican National Committee distributed new internal talking points on Tuesday. WASHINGTON (CNN) - The Republican National Committee is instructing surrogates to accuse the Obama administration of trying to "fool Americans" into supporting their heath care plans by hyping GOP figures who've spoken positively about the plan, according to internal RNC talking points provided to CNN on Tuesday by a Republican source outside the committee. In recent days, the administration and its Democratic allies have pointed to a handful of prominent Republicans who support the idea of passing some kind of health care legislation by the end of the year. This week, California Gov. Arnold Schwarzenegger, former Health and Human Services Secretary Tommy Thompson and former Senate Majority Leader Bill Frist - all Republicans - endorsed the idea. So did New York City mayor Michael Bloomberg, a Republican-turned-independent. The RNC's response, according to the internal talking points: "The White House's latest tactic to rescue its failing health care plan is highlighting Republicans who say they support health care reform to fool Americans into thinking these Republicans support the president's government-run health care experiment ... This is yet another example of the White House's preference for P.R. over substance." Gen. David Petraeus was diagnosed with prostate cancer in February. 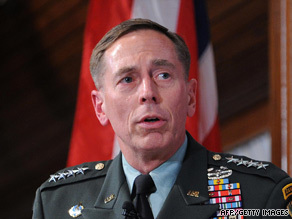 (CNN) - Gen. David Petraeus, the top U.S. military commander in the Middle East, has been treated for early stage prostate cancer and says recent screening tests have delivered "very positive" news. He was diagnosed in February, his office said, and underwent two months of radiation treatment at Walter Reed Army Medical Center in Washington, D.C.
"My cancer was caught very early," Petraeus, 56, said in remarks released by his office. "I've had two PSA tests since completing treatment five months ago, and they've both been very positive. Surgery to remove the prostate was not an option due to plates/screws that were used to repair my pelvis after it was fractured in a parachuting accident." PSA tests are blood tests performed to screen for prostate-specific antigens - proteins produced by cells of the prostate. Higher levels of PSAs could signal prostate cancer or benign prostate conditions. At an appearance Tuesday after news of the treatment was out, Petraeus made only a lighthearted comment about this health. WASHINGTON (CNN) - Embattled Republican Sen. John Ensign told CNN Tuesday he did not break Senate ethics rules by helping to secure a lobbying job for the husband of the woman he had an affair with. "I think it's pretty clear. I said in the past, I recommended him for jobs just like I've recommended a lot of people," Ensign told CNN senior congressional correspondent Dana Bash and congressional producer Ted Barrett. "But we absolutely did nothing except for comply exactly with what the ethics laws and the ethics rules of the Senate state. We were very careful in everything that we did. You can see our statements on that." The comments come four days after The New York Times reported the husband of the woman Ensign had a affair with, Doug Hampton, has since lobbied the Nevada senator on behalf of his clients. The New York Times also reported evidence that suggests Ensign played an active role in getting Hampton the lobbying position. Hampton, a former senior aide to Ensign, is barred by congressional ethics rules from lobbying his old boss for one year after leaving his post in the Senate. A preliminary Senate ethics investigation has been launched. "All of these things will, you know, come out," Ensign told CNN. "All of these things will come out at their due time. But there's no question, we complied with all of the ethics." Asked if he has any plans to resign his seat, Ensign said only: "I am focused on doing my work. I'm going to continue to focus on doing my work." Ensign spoke with CNN as he walked from his office in the Russell Senate Office Building to the Capitol. In the latest installment of CNN=Politics Daily: Senior Congressional Correspondent Dana Bash lands an exclusive interview with embattled Republican Sen. John Ensign about a possible ethics investigation over questions that followed his affair with a staffer's wife. Meanwhile: President Obama holds a bipartisan meeting at the White House to discuss strategy for Afghanistan. Senate Majority Leader Harry Reid gives his assessment of the talks. Finally: The Situation Room's Wolf Blitzer questions Minority Whip Eric Cantor about Tuesday's meeting at the White House and whether he feels Republican viewpoints were taken into account. Selling depictions of animal cruelty like this amateur dogfighting video may be illegal under a 1999 statute. WASHINGTON (CNN) - The Supreme Court voiced deep free speech concerns Tuesday about a law designed to stop the sale and marketing of videos showing dog fights and other acts of animal cruelty. The justices heard an hour of lively debate about the scope and intent of the decade-old statute that supporters say has done much to stop the spread of profiting from the torture and abuse of animals. But media groups and the National Rifle Association were among those who say the law is overly broad. "It's not up to the government to decide what are people's worst instincts," said Justice Antonin Scalia. "One can contemplate a lot of other areas, where government could say: You are appealing to people's worst instincts, and, therefore, movies cannot be made" showing dramatized depictions of animals being abused, for example. WASHINGTON (CNN) - Amid nervousness about states' economies and a growing unemployment rate, the Obama administration is considering a series of measures aimed at putting many Americans back to work before the 2010 midterm elections, sources close to the process told CNN. The effort is largely being directed by the Treasury Department and Lawrence Summers, director of the National Economic Council, one source said. Ideas include enhancing tax credit flexibility for small businesses, extending unemployment and health benefits and offering states temporary "loan packages" to help governors get through the worst of the recession. Unlike the stimulus package, the loans to states would be voluntary: "We would like to avoid the stimulus problem," the source said. Other options being examined by the White House, according to two Democratic sources close to the process, include extending the $8,000 tax credit for new homebuyers, set to expire November 30. 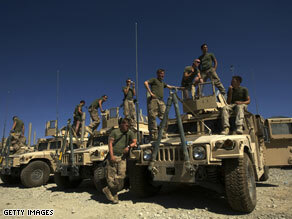 GOP urges quick decision on Afghanistan after talks with Obama. WASHINGTON (CNN) - Leading Republicans urged President Barack Obama to make a swift decision in favor of more U.S. troops for the war in Afghanistan after talks between the president and congressional leaders Tuesday. Obama faces an expected request for thousands of more U.S. troops from Gen. Stanley McChrystal, the U.S. commander in Afghanistan. He had leading members of Congress from both parties over to the White House on Tuesday afternoon to discuss the future of the war, which turns 8 years old Wednesday. "Obviously, there are many of us who feel that delay does signal uncertainty to the region," Rep. Eric Cantor, the House minority whip, told CNN's "The Situation Room." Cantor, of Virginia, said Republicans would support Obama if he agrees to send more troops into the conflict. But "If the president chooses to go a different route, you know, it is obviously going to be tough for us," he said.